Another chapter between Pep Guardiola and Jose Mourinho is set to unfold, yet it’s surreal that even a four-year break couldn’t rid the highly anticipated tension between the two managers. This is the first time the two managers will be in opposing dugouts in a competitive match since Real Madrid clinched La Liga in 2012, yet it feels as if nothing has changed. That final match at the Camp Nou represents the sole time Guardiola hasn’t claimed a domestic title, but more importantly it signified a key moment in their managerial careers. Initially it appeared Guardiola had lost the war – Mourinho was league champion, whereas the constant battle with the then-Madrid manager pushed the Spaniard into a year sabbatical to get away from his true passion. Yet, Mourinho failed to capitalize on Guardiola’s departure, and was subsequently dethroned by 15 points to Tito Vilanova’s Barcelona, thus resulting in Mourinho being fired for the first time in his career. Since then, neither manager has been able to return to a Champions League final, and have equally been considered underachievers for their work at Bayern Munich and Chelsea. At Bayern, Pep was unable to guide the German champions to another European crown, whereas despite guiding Chelsea to the summit in England, Mourinho’s main goal was to build a dynasty – the Blues endured the worst title defence in Premier League history, finishing tenth, and the Portuguese manager was sacked in December. More so, Manchester was supposed to serve as a therapeutic reinvigorating challenge for Guardiola. An opportunity to prove the cynics wrong – to build a team requiring evolution in nearly every position and transform them into an elite European side that produces breathtaking football. It was a challenge that threatened the other Premier League giants, specifically Manchester United who were spiralling downwards under Louis van Gaal. Similar to Real Madrid at the turn of the decade, United required a solution to not only challenge Guardiola, but in the process regain their annual title challenger status. Ultimately, they turned to Mourinho: a man who craved the job since Sir Alex Ferguson announced his retirement, and who already crippled Guardiola’s mindset in their previous battles in Spain. Their El Clasico battles sparked attention worldwide – it helped that the two best players of our generation combatted against each other in their prime – but to Guardiola’s dislike, these encounters are vividly remembered for the off-the-field/media hype opposed to the football itself – in truth, the quality of the games were generally poor. There’s a growing feat that similar football displays may occur in Manchester, and for both managers, that’s not an ideal prospect. The Manchester Derby may not generate media attention equivalent to El Clasico, but the rivalry and hatred amongst both clubs and supporters is parallel. Still, the upcoming chapter in the Guardiola and Mourinho tale supersedes anything ever witnessed in the history of the derby. It’s bigger than Wayne Rooney’s acrobatic winner at Old Trafford, Michael Owen’s stoppage time winner in the 2009 seven goal-thriller and the Vincent Kompany goal that guided City to their first Premier League title in the modern era. This is football idealism vs. the ultimate pragmatist, proactive battling reactive, attractive possession oriented football aiming to solve a well-drilled organized defence. The contrasting styles of football, and off-the field managerial antics and preferences doesn’t alter the fact that both men crave success. And while it’s normal for attention to be placed on two of the sought out managers in the sport, their first showdown in over four years lacks significance from a footballing perspective. Guardiola remains keen on having his players drilled into his football philosophy and lifestyle, whereas Mourinho’s pragmatism doesn’t conflict with his care for his players and vice-versa, and though both have evident flaws, they’re aim to win is perceived via dissimilar methods. Past wars in Spain didn’t benefit either manager, and frankly another attempt by Mourinho to replicate an archaic method of draining his counterpart through the media would likely backfire. With Jurgen Klopp, Antonio Conte, Arsene Wenger and Mauricio Pochettino around, Mourinho doesn’t have the time to reignite an individual war with Guardiola. It won’t work. The decision to bring Zlatan Ibrahimovic to the Premier League, however, insists that psychological battle with Guardiola may continue. Guardiola’s relationship with Ibrahimovic deteriorated quickly when they were both at Barcelona in 2010-2011, and the possibility of the Swede finally gaining revenge on his former manager hints that Mourinho’s hostile approach may continue at Old Trafford. It’s success or failure for Mourinho, and though he’s finally at a club that provides patience, stability and long-term support, the Portuguese manager would be unable to cope finishing behind Guardiola. Similarly, Guardiola’s massive overhaul at the Etihad suggests Mourinho is in the ideal position to inflict the first blow, raise the pressure on the Spaniard, and win now. Likewise, United’s joint best defensive record benefitted Mourinho prior to his arrival, but he’s yet to identify the proper balance in attacking positions. Mourinho has yet to alter his starting XI, and reliance on the individual brilliance of Ibrahimovic, and a late winner from Marcus Rashford indicates United are far from the finished product. They’re not the powerful, never say die Chelsea that perplexed English sides with the introduction of the 4-3-3. The brilliance of Wesley Sneijder behind lethal strikers, whilst ahead of physically imposing midfielders and centre-backs doesn’t compare. And the relentlessly slick counter-attacking machine that steamrolled teams at the Santiago Bernabeu – and effectively halted Guardiola’s tenure at Barcelona – would be difficult to replicate without a Cristiano Ronaldo-esque threat upfront. Mourinho’s United are capable of developing into a direct, transitional nightmare for opponents in the future – look no further than Henrikh Mkhitaryan and Marcus Rashford’s cameo at Hull two weeks ago for evidence – but reliance and faith in Rooney and Ibrahimovic, the former in particular, stagnates an immediate stylistic alteration. City, on the other hand, also have to hand debuts to several summer signings, whilst continually building towards perfecting Guardiola’s ideology. The false full-backs, instant counter-pressing, and insistence to quickly cycle through possession requires time, but clearly suggests City’s peak form awaits, despite impressive spells of dominance in previous league matches. The ball-playing wizards consisting of Xavi, Iniesta, Sergio Busquets, or the sheer greatness of Lionel Messi aren’t at Guardiola’s disposal at the Etihad. Arjen Robben’s threat, combined with the tactical and positional universality of Philip Lahm, David Alaba and Thomas Muller can’t be relied on either. Even though, Guardiola has successfully revolutionized the manner in which Barcelona and Bayern Munich effectively ply their trade, the Spaniard’s workload at City is undoubtedly his biggest challenge. A broken model built around individualism and possessing the most talented squad is the antithesis of a Guardiola side, and the pressure to build a cohesively flexible unit and claim silverware poses an arduous challenge. Nevertheless, the most fitting aspect involving the two sides is that they’re generally at the same level of development. Though United are generally built to win the league this year, Guardiola’s talent base can suffice while they adapt to his well-detailed tactical scheme. The football plot lines are also interesting. How will Guardiola replace the suspended Sergio Aguero? 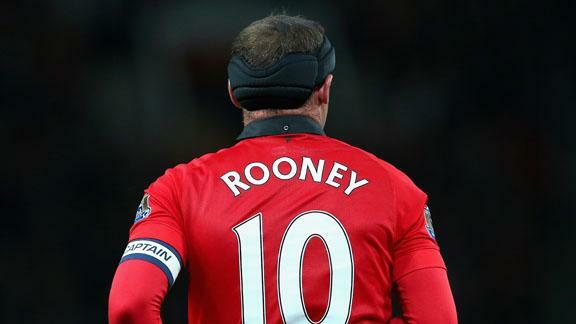 Will Mourinho finally drop Wayne Rooney for an additional midfielder to ensure United aren’t overrun in midfield? Is this the ideal match for debutants such as Ilkay Gundogan, Leroy Sane or Claudio Bravo to start? Saturday’s derby should provide a brief example of what could be the most thrilling title race in the league’s history, but the most anticipated match of the season must display improved growth opposed to resuming fireworks. The tactical ideologues for both managers have been questioned following recent failures, and though the possibility of a cagey and cautious encounter is expected, the platform presented to make a statement is available. Titles aren’t won, nor are philosophies fully integrated in September, but avoiding defeat will be imperative, here. Both managers have experienced memorable nights in Manchester, but now they aim to conquer a city that is big enough for one true winner. Failure is no longer an option and the pressure is on both managers to make an immediate impact, but where media rants and touch-line quarrels dominated headlines, this new chapter has to be about the football. An identity crisis looms throughout Manchester, and though Saturday’s derby will provide more answers, the dawn of a new era emerging throughout the Premier League will slowly transition into a global spectacle. All eyes will be on Old Trafford, the ‘Theatre of Dreams’, where ironically, one can be prematurely crushed. All eyes are set on Paul Pogba. What appears to be the final incoming transfer at Old Trafford has smashed the world transfer record. At the age of 23, Pogba, is now the most expensive player in world football, joining Manchester United for a record fee £89m. It’s gut-check time – all the hype, all the dabbing, all the aspirations of becoming a Ballon d’Or winner will be displayed on a weekly basis in the most watched league in the world. The global spotlight now rests on the young Frenchman, which is largely why he decided to return to Manchester. Leaving Juventus – a club on the cusp of becoming genuine European contenders and already perennial Italian champions – for Manchester United is currently a significant downgrade, which equally illustrates United’s intent to regain an elite status across the continent. “I spoke with a lot of players when he was at Madrid; I spoke with [Alvaro] Morata and I spoke with others and they all told me he’s the coach for me because he’s going to make you work harder. I feel this,” Pogba told MUTV. Without Champions League football, Jose Mourinho’s United were still capable of luring Zlatan Ibrahimovic, Henrikh Mkhitaryan, Eric Bailly and Pogba to Old Trafford, thus making an alarming statement to their domestic and former European rivals. A domestic winner and proven striker upfront will ease Mourinho into his job, whereas Mkhitaryan is a creative upgrade in the final third and Bailly is an exciting athletic prospect at the back. Pogba, however, is the marquee signing, and the aim is for the Frenchman to command the midfield zone for the next decade. This is why United invested so much money in a nearly finished product, but similar to the aforementioned summer signings – excluding Bailly – it’s uncertain how Mourinho will utilize the players at his disposal. On paper, United appear to be a genuine title contender, but apart from bolstering the midfield and attack with top-class talent, you can argue that the incoming players weren’t desperately required and only Ibrahimovic’s role has been defined. While Pogba is the marquee player, most teams including Ibrahimovic are built around the Swede upfront, which could be problematic from a short-term perspective. This could explain why Ibrahimovic has yet to win a Champions League during his career – eventually the entire attack is solely based around long balls into the striker as most coaches wisely attempt to maximize his full potential. At least for this season at Old Trafford that may be true, as the Swedish striker has yet to show significant signs of declination, whereas his dual role would compliment Pogba’s late runs into the box, thus improving United’s attack. Therefore, Mourinho is likely to field Wayne Rooney in a no.10 role assuming he utilizes the 4-2-3-1 that’s been his base system at Real Madrid and Chelsea. During those tenures Mourinho’s preferred midfield featured Xabi Alonso and Sami Khedira at the Santiago Bernabeu, whereas Cesc Fabregas and Nemanja Matic protected the backline at Stamford Bridge. The former features a hybrid of a destroyer/wide-ranged passer with a tenacious runner, while the latter showcased a positional undisciplined creator with a technical ball winner. Pogba’s versatility enables the Frenchman to operate in various roles, but he failed to excel in Deschamps’ 4-2-3-1 throughout his international career – most notably at Euro 2016. Aiming to maximize Antoine Griezmann’s goal threat was logical, but it equally meant Pogba’s influence was sacrificed. In the latter stages of the tournament, Pogba was cautious of his positioning and often played deeper near the centre-circle to play passes going forward, as neither the 23-year-old nor Blaise Matuidi are natural defensive midfielders. Nevertheless, this isn’t to say Pogba won’t or can’t be utilized in a midfield duo. Home matches against inferior opposition should see United dominate majority of the possession, which would allow Pogba to join the attack, whilst Michael Carrick or Morgan Schneiderlin holds their position to protect the defence. The worry for United is they currently lack a reliable top class defensive midfielder, and were constantly exploited in transitional phases against Leicester City in Sunday’s Community Shield. Mourinho could turn to Morgan Schneiderlin to as a temporary solution, but Pogba’s compatriot is arguably better suited in the opposite shuttling role due to his dynamism. With that being said, Mourinho is renowned for flipping his 4-2-3-1 into a 4-3-3 in the bigger games, and that would enable the Frenchman to play in the shuttling role that was responsible for his rapid prominence at Juventus. The shuttling role presents Pogba the freedom to charge forward into attack but also utilize his brute strength to regain possession in central areas. United’s midfielders are more adept to shuttling opposed to operating in a double-pivot, which may force Mourinho to eventually alter his main system. Although there are still selection issues that could arise regarding Rooney’s first team status once Pogba is declared match fit, and Juan Mata’s future at the club, United appear better equipped utilizing a three-man midfield. Considering the large amount of money spent to sanction Pogba’s return, Mourinho’s main goal surely rests upon maximizing the world’s most expensive player’s threat. Apart from slight mental lapses in terms of positioning, and letting his emotions alter his performance, Pogba is an exceptional all-rounder with all the tools required to dominate a league that is slowly regaining its tactical essence. Whether it be goals, creativity, power, or sheer technical ability, Pogba has it all, and considering he’s yet to reach his peak, Mourinho’s experience in elevating a player’s confidence can prove decisive. Perhaps he’s never been the standout player or midfielder during his time in Turin, but now, Pogba must now rise to the challenge and consistently produce standout performances. Failure to instantly seam into the Manchester United setup could lead to psychological issues and possible stagnation that has witnessed other marquee signings fail in the past. But with every risk comes a possible reward, and United’s excessive transfer fee for the most sought out young player in world football is a triumph that can’t be overlooked. With Pogba, United aim to provide the Frenchman a platform to begin an era of dominance in what might be the most competitive Premier League seasons in the competition’s history. The stage is now yours Paul, you have our attention. Individual failure at the World Cup was the greatest thing to happen to Manchester United this summer. Amongst the constant banter regarding Arturo Vidal’s future, United was back to business at the Guinness International Champions Cup. The Red Devils were undefeated in four matches at the pre-season tournament, including victories over European champions Real Madrid and rivals Liverpool. Silverware was a distant fantasy throughout David Moyes’ tenure, as the Scotsman only has a Community Shield triumph against Championship side Wigan last season, with United finishing in seventh place; a club low in the Premier League era. The World Cup didn’t provide a change of fortune for the United players, as only the likes of Javier Hernandez, Marouane Fellaini, and Adnan Januzaj –– with Hernandez and Januzaj playing a bit-part role in Brazil –– progressed past the group-stage. Juan Mata and David de Gea were forced to watch Holland and Chile blitz Spain, Wayne Rooney and Danny Welbeck couldn’t lift a youthful English side past Italy or Uruguay, Antonio Valencia’s Ecuador lacked quality on both ends, and neither Shinji Kagawa nor Nani could serve as a catalyst for their respected nations when it mattered. Then there was Robin van Persie, who vastly declined subsequent to Holland’s opening match, but captained a side that came within spot-kicks of returning to the World Cup final. Holland left Brazil unbeaten, claiming victories against Spain, Chile and Brazil, and their success was down to Louis van Gaal’s tactical tinkering. Van Gaal, the antithesis of Moyes, didn’t receive time to reflect on a successful World Cup campaign, though, as he was handed the responsibility to make amends for United’s disappointing season. And in little under a month we’re beginning to see United take shape. The drive to impress van Gaal and win football games has been displayed in the discipline and work ethic both on and off the ball. In what was undoubtedly a forgettable spell at Old Trafford, the hunger that United lacked under Moyes was evident. The contrast between Moyes and van Gaal is vast. From the experience at the highest level, to their football philosophy, and the level of confidence and arrogance that both men possess, van Gaal appears to be a significant upgrade. He’s won league titles in three different countries, and failing to feature in the World Cup final has left a fire under his belly to become a champion once again. In fairness, preseason results are irrelevant; it’s an opportunity to see what combinations work, improve fitness, and assess the squad at your disposal. Still, the hunger, and increased signs of improvement –– although United couldn’t get any worse –– have given fans a sense of optimism as we approach opening weekend. Majority of van Gaal’s success, however, was achieved in the previous millennium, where he was handed time and patience to instill his philosophy. Van Gaal may not receive that luxury at Old Trafford, so his intent on winning the fans over and claiming silverware –– regardless of its significance –– was integral. The departures of veteran’s Nemanja Vidic, Rio Ferdinand, and Patrice Evra marks the dawn of a new era at Old Trafford, and van Gaal’s preference to work with younger players should lead to a smoother transition. The days of the traditional 4-4-2, and United’s persistence to solely play down the wings under Moyes is of the past, as stylistically, van Gaal is administering a different approach that offers variety in attack. By no means is van Gaal a tactical genius. Frankly, the Dutchman is similar to Jose Mourinho, as he ensures his players stick to their tasks with devastating efficiency. Van Gaal, though, may be methodical like his Portuguese rival, but he’ll provide United with flexibility. He’ll alter from a three-man to a four-man defence, as he prefers to have a spare man in defence to retain possession, but also withhold a numerical advantage out of possession. While Moyes’ decisions were often peculiar and heavily questioned, van Gaal displayed his ability to alter games on the fly. A change to a 4-3-3 against Mexico led to Arjen Robben’s dominance, and the decision to call upon Tim Krul in a penalty shootout is one of the standout storylines at the World Cup. Equally, apart from the personnel, there’s very little separating Holland’s approach at the World Cup to United’s displays in pre-season. The swift transitional attacks, high-pressing and defensive line, along with the man marking in midfield has been evident. The young English duo of Chris Smalling and Phil Jones will get their chance to mature and prove their worth alongside one of United’s most consistent performers over the past few seasons in Jonny Evans. Their athleticism will enable United to play a high-line –– an option that proved suicidal with Ferdinand and Vidic in the XI –– and although the risk of the opposition exploiting space behind the trio is likely, United’s chances of winning the ball in advanced positions will increase. Smalling’s performances in preseason, however, has forced van Gaal into the transfer market as he searches for a versatile centre-back, but stellar displays in Brazil from Dirk Kuyt and Ron Vlaar should serve as a sign of optimism for Red Devils fans. The arrival of Ander Herrera provides United with the dynamism and penetration from central areas that they’ve severely lacked in recent years. Van Gaal also appears capable of resurrecting careers at the Theatre of Dreams. Ashley Young and Antonio Valencia have solidified their roles as adequate replacements for Luke Shaw and Rafael at the wingback position, with the former scoring goals and creating quality chances on both flanks. Equally, Darren Fletcher’s transition into a deep-lying passer led to a few man-of-the match performances that could see him feature sporadically this season if he can cope with the pace of a competitive match. The highpoint from United’s tour across the United States was the production from the front three. Danny Welbeck’s tactical discipline remains one of the England international’s key traits, but Rooney and Mata –– players that have been chastised over their defensive work in big games –– were equally impressive in and out of possession. Rooney’s tendency to impress when his position is under threat is unsurprising, but whether the 28-year-old and van Gaal can maintain a fruitful relationship, along with his maintaining his fitness levels throughout the season is up in the air. 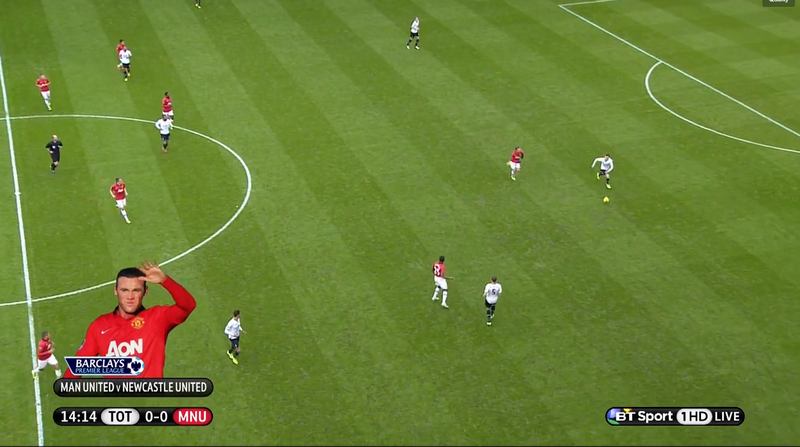 Mata, on the other hand, is now playing in his preferred no.10 role in van Gaal’s 3-4-1-2. Not only does the Spaniard receive the space to offer creativity, but van Gaal’s direct style has seen Mata’s verticality reap rewards as he’s playing at the level that saw the 26-year-old transition into a world-class player at Chelsea. If Mata, van Persie and Rooney can fire on all cylinders, and still have Welbeck, Javier Hernandez and the pace of Adnan Januzaj and Wilfried Zaha available, it’s evident that United’s strength lies in their attack. Still, claiming the Premier League in the first season will be a stern challenge for van Gaal, considering the competition that awaits the Dutchman. Majority of the teams that finished ahead of the Red Devils have improved over the summer, while United have a month to sort out there issues in midfield and defence. Ultimately, United lack the depth of Liverpool, Arsenal, Chelsea and Manchester City in midfield and defence. For instance, if Herrera were to get injured, Tom Cleverley or Marouane Fellaini –– conservative sideways passers –– would slot into midfield. Despite Fletcher’s impressive preseason, it’s key to note that he’s an unreliable option due to his health and fitness conditions. Likewise, if Jones, Smalling or Evans were unavailable, van Gaal would be forced to turn to his academy players. This isn’t necessarily a bad option, but not an issue a Premier League title winner would be forced into. This was never a job destined to be fixed in one season, and not only is a place in the top four an attainable goal, but it should also be deemed a success if they finish in a Champions League spot. United has a relatively manageable schedule until October, along with no European competition burden, so the possibility of replicating Liverpool’s success of last season isn’t too farfetched. However, it would take something special to overtake the complete squads that Chelsea and Manchester City possess. Considering the timing, van Gaal and United appear to be the perfect match, as the Red Devils aim to return amongst the Premier League’s elite sides. After Sunday’s 2-2 draw against Fulham, many were criticizing David Moyes’ attacking approach. Although United completed 86 crosses in the match, displaying a lack of variety in attack, Moyes’ side was atrocious on the defensive end. Despite dominating possession for large portions of the match, individual errors led to Steve Sidwell’s opener and Darren Bent’s late equalizer. With a trip to the Emirates Stadium on the horizon, United couldn’t afford to drop points if they had any hopes of finishing in the top four. 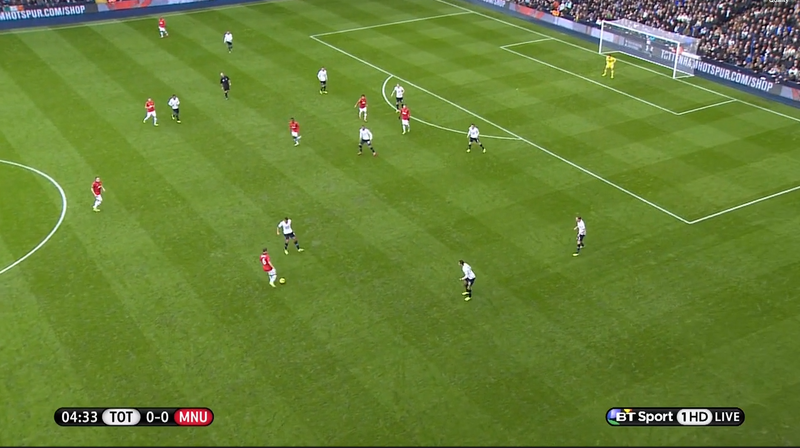 United dropped into a 4-5-1 without the ball, as they focused on minimizing space between the lines. Michael Carrick and Tom Cleverley provided astute protection in front of the back four, and Arsenal’s attacking players were unable to get into dangerous positions around the final third. Moyes instructed his men to sit narrow – identical to their performance at Old Trafford earlier this season – but this time wide players Antonio Valencia and Juan Mata prevented Arsenal’s fullbacks from pushing forward. United was set up to contain Arsenal’s attacking players, and they succeeded. The Gunners created minimal chances from open play, their ball circulation was slow, and they lacked the penetration and guile to break down United’s back line. The issue with United’s approach was that it sacrificed their threat on the attack. Apart from three squandered efforts from Robin van Persie, United didn’t test Wojciech Szczesny. Rooney was often yards away from the Dutch striker, and when United held possession, he was unable to receive the ball in key areas. Overall, United’s attack was stagnant; van Persie was constantly flagged offside, and with Moyes keen on his central midfielders – and Rooney – sitting deep, the champions lacked runners. Moyes’ approach was logical, and it earned United an important point. However, while the Red Devils completed a job without the ball, their threat on the attack was languid. Mesut Ozil’s form has been heavily critiqued and ridiculed over the past few months, and his performance at Anfield over the weekend was the last straw. Ozil’s involvement in two Liverpool goals left many questioning whether he truly is a world-class player. While the sudden outrage in Ozil’s status is bizarre, encountering a dip in form in your first season in England isn’t. Nonetheless, the German playmaker took it upon him to silence the critics at the Emirates. Statistically, he was superb, creating the most chances and completing the most passes in the final third. Although Ozil wasn’t the best player on the pitch, he was certainly the most influential Arsenal player. Laurent Koscielny – Arsenal’s best player on the night – nodded Ozil’s corner towards the back post, but it was cleared by Valencia, and his intricate passing with Santi Cazorla, led to the Spaniard forcing David De Gea to make a key save. 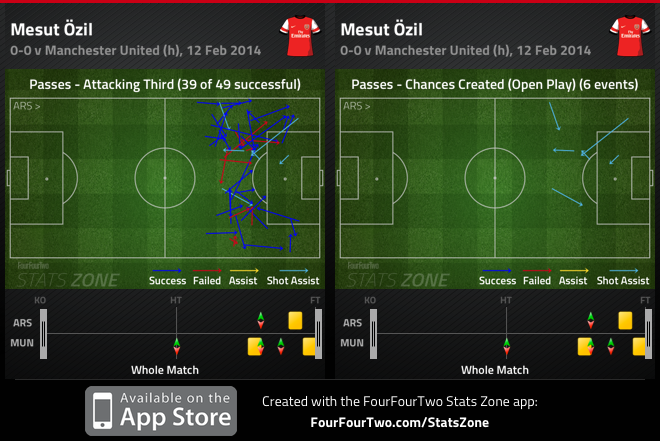 For the most part it looked like the gap in quality between Ozil and his teammates was vast. Ozil roamed around the final third playing passes with his teammates, and creating space for others to penetrate, but nothing came of it. Likewise, when he did attempt to play intricate passes in tight spaces the receiver often couldn’t play a returning pass. Ozil’s price tag leaves him vulnerable to heavy criticism, but as of late it’s difficult to pinpoint an attacker who’s produced consistent performances. 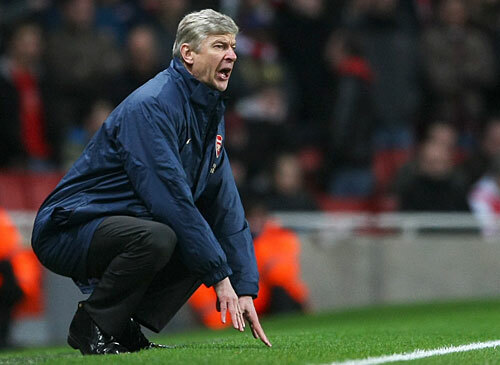 Arsene Wenger had one job to complete during the January transfer window – purchase a striker. An entire month flew by, and despite a few warning signs regarding fatigue and performance levels, Wenger was reluctant on meeting the wishes of Arsenal supporters. Apart from their victory against Spurs earlier this season, Olivier Giroud has failed to score against the league’s top-sides. Giroud’s enjoyed a good campaign as Arsenal’s main striker this season, but his inability to provide goals in these matches has affected the Gunners’ results. With Arsenal’s summer pursuit of Luis Suarez proving to be unsuccessful, and Theo Walcott sidelined for the remainder of the season, many expected Wenger to jump into the January market. The Frenchman, however, fully believes that the squad at his disposal possesses enough quality to end Arsenal’s nine-year trophy drought. Wenger included Nicklas Bentdner, Lukas Podolski and Yaya Sanogo on the bench against Manchester United, yet the trio witnessed Giroud struggle at the Emirates. Despite outmuscling and pestering United captain Nemanja Vidic in the first-half, the French international’s finishing was poor. In the 76th minute, Sagna created Arsenal’s best opportunity, but Giroud failed to convert the right-back’s delightful delivery into the six-yard box. Giroud’s lack of pace puts him at a disadvantage, and his link-up play with advancing midfielders has become predictable. It’s illogical to believe the sole purchase of a striker would win Arsenal a trophy this season, but with the Frenchman showing evident signs of fatigue, a competent, alternative option could’ve been beneficial. More so, Giroud’s poor performance symbolizes the Gunners’ issues upfront, but with three options at their disposal, maybe it’s time Wenger gives his main striker a rest. Many milestones have been broken at Old Trafford this season. Most recently, Everton and Newcastle ended overdue winless droughts at the Theatre of Dreams, and West Ham was looking to replicate their achievements. Manchester United were in jeopardy of losing three consecutive home matches for the first time since 1979, as West Ham came into the match confident off their midweek Capital One Cup victory at White Hart Lane. United took control of the match in the opening minutes, due to West Ham’s cautious approach. The issue David Moyes’ side encountered was the lack of creativity in the final third. 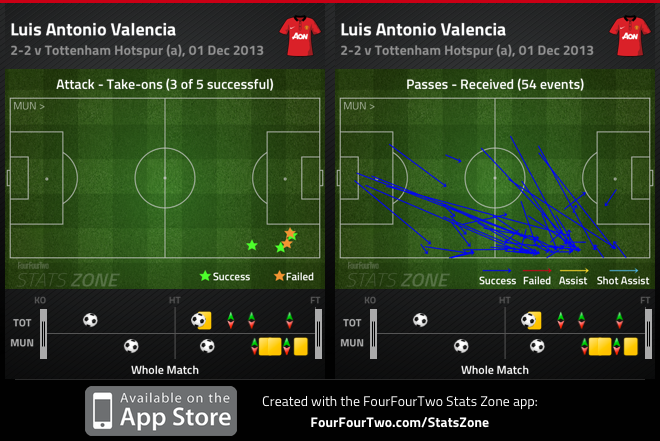 Luckily, Antonio Valencia and Rafael continued to impress down the right flank, completing the most passes between two players. United’s main goal in the first was to overload the right flank – a tactic used during Moyes’ tenure at Everton – Tom Cleverley and Phil Jones drifted forward towards the right, aiming to find openings behind George McCartney, but they rarely harmed the West Ham back line. United dominated possession in the opening half, but rarely tested Hammers goalkeeper Adrian. However, Danny Welbeck’s inventive back heel to Rooney was the magic Moyes’ side lacked in the final third, and it was fitting that it led to the Englishman’s left-footed strike past the West Ham keeper – his first home goal in 14 months. Subsequently, it was Welbeck’s ability to hold up the ball, and James Collins’ putrid defending that led to Adnan Januzaj’s first goal at Old Trafford, doubling United’s lead and securing three points. The Welbeck/Rooney partnership has reaped rewards in the past, and here, Welbeck was pivotal – thus leaving Moyes worried, when the English striker was forced to leave the match early in the second half. United’s midfield was untested as Jones comfortably protected the back four, and confidently drove at the heart of the West Ham back line. 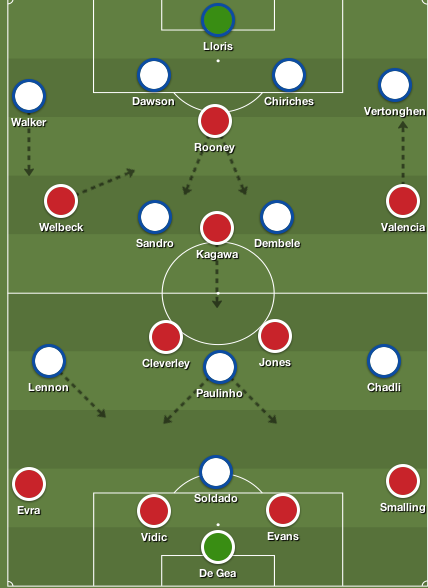 Cleverley passed his way through midfield, whilst Rooney began to find pockets of space between the lines, and picked up deeper positions in midfield to demonstrate his excellent passing range and help the midfield duo sustain possession. Also, Chris Smalling and Jonny Evans were magnificent – displaying defensive solidity and assuring that United may have found their new first team centre-back partnership. Although Carlton Cole found a way through United’s impeccable backline, Moyes’ right side replicated their first half performance and constantly tormented McCartney. The West Ham left back was exposed for United’s third goal when Rafael played a lovely ball to Valencia in the right channel. The Ecuadorian’s cut back pass to Rooney was decent, and the Englishman laid it off to substitute Ashley Young, who struck the ball into the top corner, scoring for the first time in 19 months in front of the United faithful. 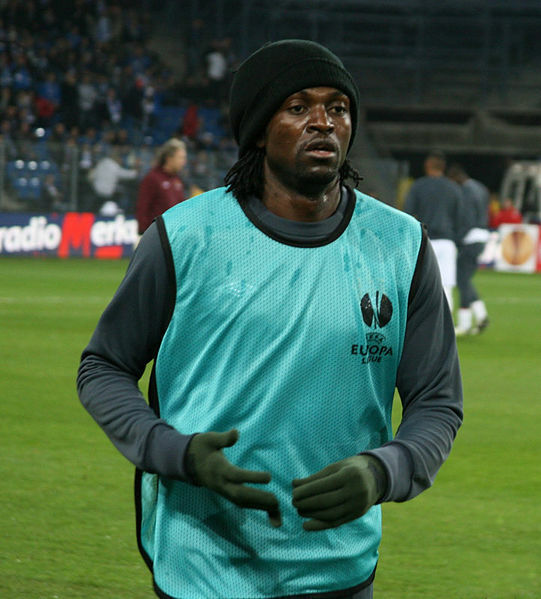 West Ham was lethargic for large portions of the match. Sam Allardyce’s men lack a significant focal point to link play and bring the midfield forward – Modiba Maiga was woeful – whereas they relied on creativity from wide areas, and their wingers were unable to get into advanced positions. West Ham’s poor away form played a factor, but Allardyce’s side desperately need a competent target man. Robin Van Persie – the man who singlehandedly won them the title last year – is unavailable, but Moyes is getting the best out of the players that recently fell out favour with the supporters. United enjoy a manageable festive period, and results of this stature will push Moyes’ side back into the title hunt. Don’t count out the Red Devils, yet. Manchester United came from behind twice courtesy of strikes from Wayne Rooney, to earn the champions a vital point at White Hart Lane. David Moyes made three changes to the side that comfortably defeated Bayer Leverkusen in midweek. 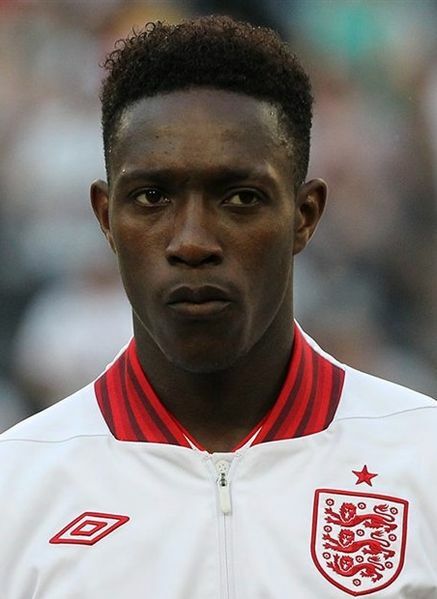 Danny Welbeck and Tom Cleverley were introduced in midfield, alongside Phil Jones, Shinji Kagawa and Antonio Valencia. Also, Nemanja Vidic made his return to the starting line up, forming a centre back duo with Jonny Evans. Andre Villas-Boas also made three changes to his starting eleven after last week’s embarrassing defeat to Manchester City. Moussa Dembele and Nacer Chadli slotted into midfield – which pushed Paulinho behind Roberto Soldado – while Vlad Chiriches played at centre back alongside Michael Dawson. This was a tight affair that was decided by individual mistakes – Spurs went ahead twice, but failure to increase their lead, and individual defensive mistakes allowed United back into the match. A main feat that contributed to the minimal chances created was the shape both sides dropped into when the opposition was in position. Shockingly, Spurs’ defence sat deeper than usual with the midfield sitting off in front of the back four, which allowed Jones and Cleverley time on the ball. Villas-Boas’ men were content with the duo sustaining possession, and there was no surprise that the Cleverley and Jones completed the most passes in the match. Soldado nor Paulinho applied much pressure on the United defenders either – Evans, Chris Smalling and Vidic completed the most passes after the duo – as it was an incentive for United to push forward, and Spurs to hit them on the counter. At times, Paulinho did work hard to close down United defenders, but there was always a spare outlet available. Lennon and Chadli tracked back into deeper positions admirably, while Sandro and Dembele worked hard to limit activity in the final third. On the other hand, United stuck to their defensive principle under Moyes, and prevented Spurs from playing out of the back. Valencia and Welbeck pressed the Spurs full backs when they received the ball, while Jones and Cleverley picked up Dembele and Sandro. 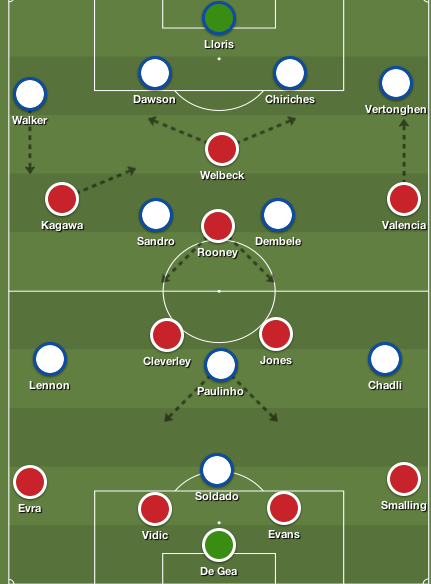 Spurs were forced to play long balls into the channels for Soldado and Paulinho to chase, and their best opportunities were often created on the break. In the 14th minute, United were nearly awarded for their work ethic out of possession, as Rooney forced Chiriches to concede possession and he played a pass to the advancing Valencia. Dawson blocked the Ecuadorian’s initial cross, but he cut the ball back to Rooney, who also had his attempt blocked by Sandro. United dominated the possession statistics due to Spurs’ approach – who chose not to press Moyes’ men – but when Villas-Boas’ men did move forward as a cohesive unit, the tempo was often slow and they lacked creativity. Similarly, there was a distinct feat in the set up of both sides, as they both enjoyed more freedom down the right flank. Valencia was an influential figure in the match using his pace and strength to get the better of makeshift left back Vertonghen. This forced Chiriches to often come across to limit his threat in the final third, while Chadli sat deeper – more so in the second half – to prevent the Ecuadorian from isolating Vertonghen and Smalling from getting forward. Likewise, the role Evra has developed under Moyes has left him vulnerable against sides that possess pacy, direct wingers. Lennon’s movement dragged Evra out of position, and the United left back was unable to cope with his pace. Also, Welbeck and Kagawa’s inclusion on the left flank ensured that Evra was vulnerable. 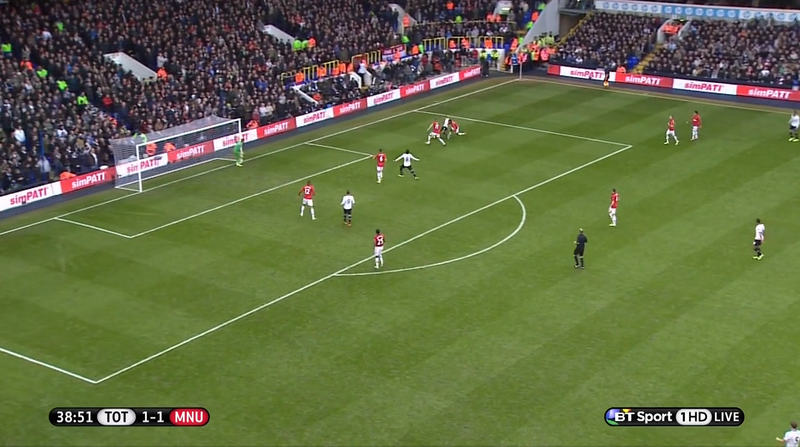 Considering majority of Spurs’ attacks were on the counter, United’s left attacker was often caught out in a central position – specifically so Evra could push forward – and this allowed Walker to surge forward. 27th min: Sandro wins a loose header that Lennon keeps in play, and the Spurs winger drove forward, holding off Welbeck and Evra, and plays a ball to an advancing Walker. Walker’s cross goes to the far post, but Chadli didn’t make a run at the far post. 30th min: Soldado freely receives the ball, turns and finds Lennon making a diagonal run into the box. The Spurs winger beats Evra for pace, fires a shot at De Gea, and then squares the rebound across the six-yard box, but it’s a few yards ahead of the unmarked Paulinho. 78th min: Jermain Defoe plays Walker in free on the counter, and Evans allows him to drive forward and play a sensational ball to Andros Townsend, but the substitute was unable to direct the ball on net. Valencia was a significant threat in United’s attack, but the threat of Lennon and Walker pushed Spurs into dangerous positions – this will be explained below. In the 17th minute Paulinho received a ball around the 18-yard box – as Jones allowed Sandro’s nod back to bounce behind him – and the Brazilian was fouled at the edge of the box by Evans, thus leading to a Spurs free kick. Walker scored from a free kick, but the main issue in this situation was the wall in front of De Gea. The free kick was positioned approximately 20-yards away from goal, and considering Walker is known to go for power opposed to precision, it was peculiar to see the United wall jump. The likeliness of Walker getting/opting to place the ball over the wall and beat De Gea was slim, and there was no need for the United wall to jump. One of the main talking points heading into this fixture was the utilization of Soldado in Villas-Boas’ attack. The Spurs striker hasn’t enjoyed a great start in the Premier League, as he’s often been an isolated figure up top. Here, Villas-Boas played Paulinho in an advanced role – Lewis Holtby hasn’t prospered behind the Spaniard, and Christian Eriksen is injured. Not only did the inclusion of the Brazilian allow Spurs to play Dembele and Sandro, but it also gave Paulinho freedom to make runs into the box. In the 28th minute, both men displayed what they offer to the Spurs attack. Paulinho played a ball to Soldado on the break and he did well to lay it for the Brazilian, who drove forward and played a well-weighed ball to the Spaniard, but he skied his shot over the net. To an extent, Soldado’s poor scoring form can be down to the lack of chances created from the Spurs midfield – however, this wasn’t the case against United. 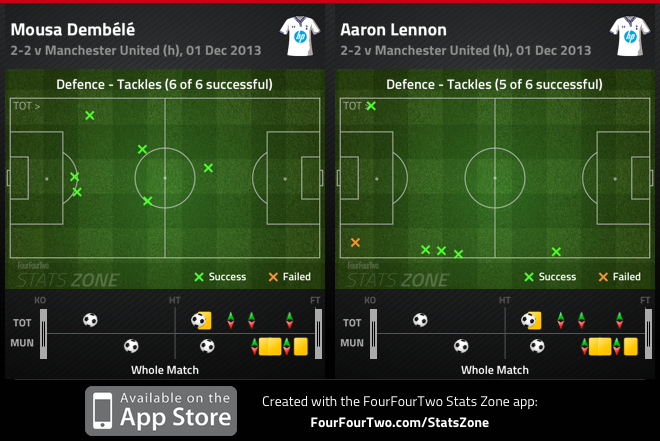 5th min: Sandro plays a good ball to Lennon, and his first touch evades Evra, forcing the United fullback to foul him. Paulinho picked up the loose ball and played it out wide to Walker, who ran behind Evra, but Soldado was indecisive with his movement, and the Spurs right back let the ball out for a goal-kick. 38th min: Dembele completed a powerful run from deep in his half and picked out Chadli, who played a nice ball behind Evra for Lennon, but Soldado nor Paulinho make a run to meet Lennon’s cross. The decision to play Paulinho behind Soldado was to get a player close to the Spaniard, in hope that he would be more involved in the attack. While Villas-Boas did succeed in that aspect, Soldado’s movement in the final third was poor, and apart from his wild shot over the goal, he didn’t come close to testing De Gea. While United sustained majority of the possession for large portions of the match, they struggled to break down Tottenham’s back line. Initially Rooney and Kagawa didn’t have an impact around the edge of the box, so they dropped deeper into central areas, to help United push forward as a unit. Equally, this didn’t improve United’s attack. Kagawa, Welbeck and Rooney were dropping into the same area, leaving the Spurs centrebacks fairly comfortable at the back. Moyes’ men didn’t offer an attacking thrust in the final third – Rooney was starved of service, Kagawa didn’t stamp his authority on the match and United failed to create one legitimate goal-scoring opportunity in the first half. Towards the end of the first half Moyes decided to play Kagawa on the left, and push Welbeck ahead of Rooney. This was a logical move because United lacked proper service in the final third, and a physical presence to compete with Dawson and Chiriches. 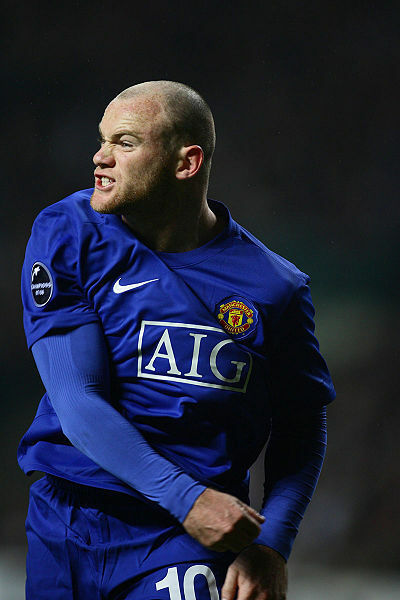 The move gave Rooney more freedom to express himself, and United were now more threatening in possession. Also, Welbeck was now a danger man because of the strength he possesses to hold up the ball, his pace to attack space behind the Spurs backline and he was still able to drift around the final third to help United sustain possession. Ultimately, Welbeck’s pace did pose problems against Spurs’ backline, and in the 68th minute, he nearly punished Villas-Boas’ men. Welbeck received a simple ball over the top in the left channel, and he beat Dawson for pace at the byline, but his cross didn’t meet Rooney, who was closely watched by Dembele. Moyes’ alterations increased United’s attacking impetus, as there was a gradual improvement in the final third – Welbeck was now an attacking threat opposed to a defensive liability, Rooney vastly transformed from a peripheral figure to United’s most important player, and Kagawa limited Walker’s freedom down the right. The most eventful moments of the match took place in the 54th minute when Sandro received the ball in midfield, drove forward, turning Cleverley in and out, before firing an unstoppable shot past De Gea. Surprisingly, it took United two minutes to equalize. Walker gambled and flew into a 50/50 challenge with Vidic in United’s third, and came up short. 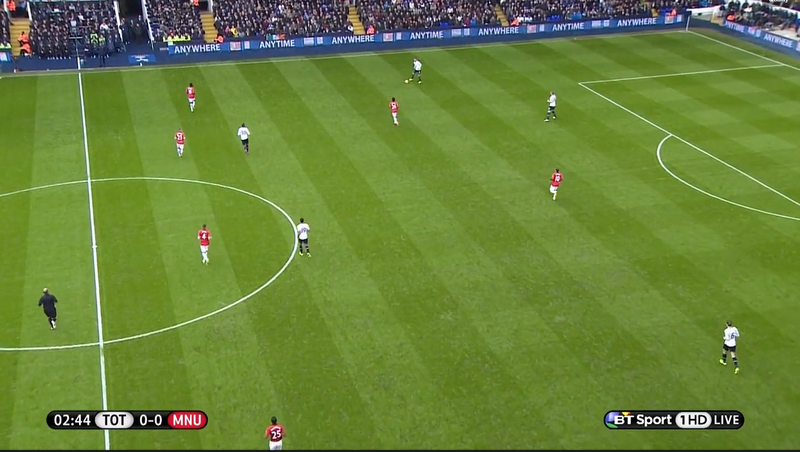 Rooney picked up the loose ball and drove towards Tottenham’s half. With Lennon and Walker out of position, Sandro was forced to drift over to close down the United striker. Had Walker been disciplined, he’d be marking Rooney, and Sandro would be in a position to cut off Rooney’s reverse ball to Welbeck. However, Spurs were lacking numbers on the break, and Rooney provided Welbeck with a magnificent ball behind the Spurs backline. The Englishman took the ball in stride, and was tripped by Hugo Lloris. Subsequently, Rooney converted a spot kick down the middle to level the score line, as United pounced on another defensive miscue from Walker. Neither side was content with a draw, as it would increase Arsenal’s lead at the top of the table to double digits. Villas-Boas replaced Lennon with Andros Townsend and Defoe for Soldado. Townsend added another element to Tottenham’s attack with his powerful running from deep areas. Unfortunately for Spurs supporters his crosses were comfortably dealt with, and he was unable to meet Walker’s ball in the 78th minute. Defoe’s impact on the match was minimal, apart from a Vidic foul near the edge of the box in the 88th minute. Defoe’s mobility was an improvement to Soldado’s, but his decision-making and lack of service in the final third hindered his chances of winning the match. Moyes’ changes were also straight swaps, as Javier Hernandez replaced Welbeck to no effect, while Nani and Ashley Young were introduced in the final minutes of the match, but there wasn’t enough time for the duo to have a significant impact. Spurs created the better chances throughout the match, but two defensive miscues – solely from Walker – gave Rooney the platform to earn United a crucial away point. Spurs will feel that they deserved maximum points, but the home side never looked comfortable when they took the lead. Their cautious approach limited United’s attacking threat, and their natural shape without the ball was a massive improvement from a defensive perspective. Spurs still need to address issues going forward, but Villas-Boas appreciated the overall response from his men. “We are extremely happy with the performance but not so much the result, because a win would have taken us above them, but it’s a good response, not a bad result,” said Villas-Boas. Once again glimpses of Rooney’s brilliance guided United to a positive result – Moyes’ men were mediocre on the day, and will need to improve as Rooney’s magic may not be enough to earn a result against Everton, Wednesday night.